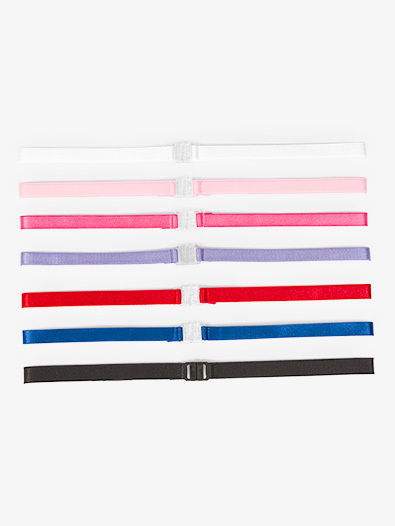 This shiny belt with matching buckle is the perfect tool for the serious dancers who wants to check hip alignment. I love these belts! I wear mine ALOT while I'm in class. And they are very helpful! It can show you if your hip is up. I got pink because it matches my tights. I will recommend this to a friend! Reading the comments before buying this belt, I worried a lot about sizing. I considered buying the adjustable one, but it seemed much more complicated (& wasn't on sale!). I ordered it in white (goes with most leotards) and when I received it, it looked just like in the picture. It's a tiny bit to large for my waist, but I just move it up (closer to my torso) or lower (closer to my hips) and it fits fine. I know you may worry about sizing, but if you want an alignment belt, then i say IT'S WORTH IT! GO FOR IT! I am giving it a 4 for not being adjustable. My 7 year old needed one for her ballet class in the hot pink color. It looks cute with her black leotard and when she accomplishes a new lesson she receives a star that I can sew onto her belt. I just wish it was adjustable or they made a kids size. Many moms tie part of it in a knot. Contrary to what another dancer said, I would recommend the wider one for beginners, that way their hips are prominent and easier to correct. I just received these in white and light pink. They are very useful in class for me. Often at my studio at home, girls wear short skirts in class, but at summer intensives, that often breaks dress codes. These will help you improve technique while also acting as an alternative to other wear during the summer. This is a very nice belt, and it has nice colors. Since it is one size, it will fit some better than others. I've been having a hard time finding alignment belts for smaller kids - 7-10 years old. The 3/4 adjustable are too widethe non-adjustable are too big. Please help. You may want to try the 1/2 " adjustable which are slightly less wide. How do you size these belts? just measure your hips? Un-stretched this belt measures approximately 25.5" in length (from end to end). With a little stretch it could possibly go to 28" in length.